Taylor Brown, left, and Alicia Lortcher registered assisted blocks as the team swept Ohio Northern University last week. The Baldwin Wallace University volleyball team swept the #17 nationally-ranked Ohio Northern University Polar Bears last week in a thrilling match at Ursprung Gymnasium. BW has not defeated ONU since the 2011 season and the Yellow Jackets were long overdue for a win against this conference foe. In the first set, both teams created back and forth, exciting action. After the Polar Bears had a five-point lead, freshman Morgan Martin took over from service with a five-point streak to tie it up. After this momentum swing, the Yellow Jackets found a way to finish off the set with the score of 25-21. The teams geared up again for the next set, where sophomore Kathleen Egan gave the Yellow Jackets a lead towards the end of the set. Ohio Northern battled back, tying the match at 24. Egan again was making plays, this time assisting the final two kills to put the set away. 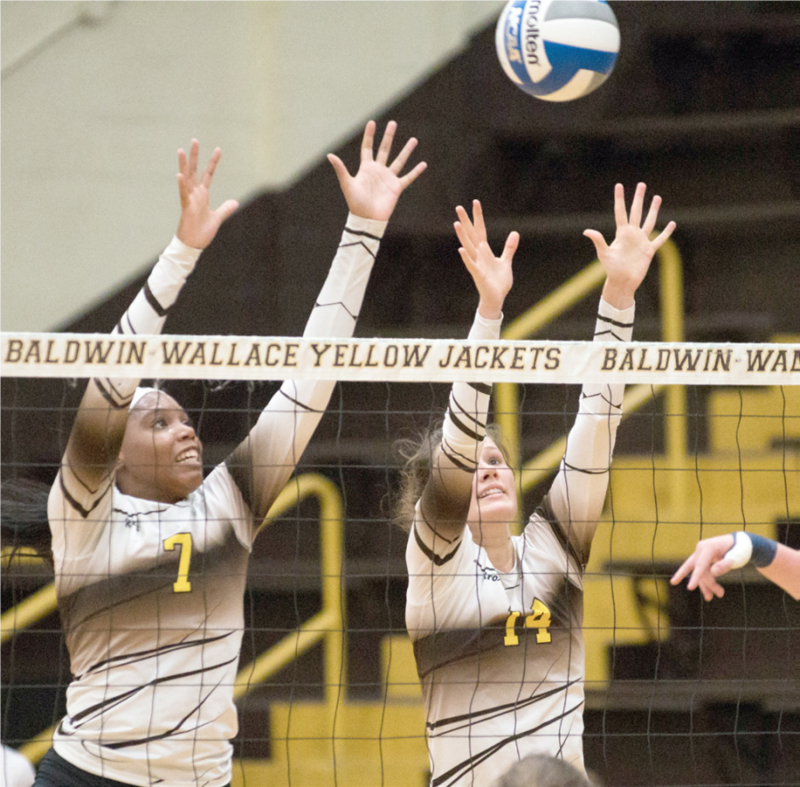 The momentum kept building into the third set as Baldwin Wallace pulled away with the victory. BW got out to the largest lead of the match, thanks to the help of a few key players. Freshman Morgan Mellinger tallied 13 kills and sophomore Taylor Brown registered 10 kills. Additionally, senior Ashley Nuding and Egan combined for thirty-seven assists. Defensively, the Yellow Jackets were swarming all over the court as four players had double-digit digs. Sophomore Sarah Reinhard led the stat sheet with 19. Baldwin Wallace also stood tall with 20 blocks, as senior All-Ohio Athletic Conference and Academic All-OAC performer Alicia Lortcher registered five assisted blocks. Despite the preseason OAC Rankings, the Yellow Jackets proved they have the recipe to make some noise in the conference. Since this victory, BW has a current conference record of 3-1. Baldwin Wallace will be back at home on October 20th against the Wilmington Quakers.